PLANET GST-80x provides advanced media conversion technology -- 10/100/1000Base-T and 1000Base-SX/LX interfaces to fulfill different kinds of demands as the current network grows and expands. The GST-80x provides diverse fiber connect type options for different network applications. It is very flexible for the GST-80x to work as a standalone device or be installed in the central management media converter chassis for centralized management. When working with the management media converter chassis, the GST-80x is hot swappable to avoid network downtime. The ideal solution to building a network solution of FTTH (Fiber to the Home) or FTTC (Fiber to the Curb), and FTTB (Fiber to the Building) for ISPs, campuses and enterprises. 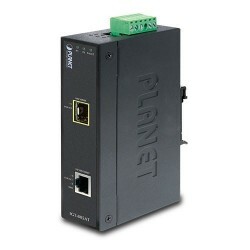 PLANET MC-1500R48 provides 15 slots for a wide range of media converter series. It allows the connectivity of up to 15 PLANET Ethernet, Fast Ethernet, Gigabit Ethernet or VDSL2 Converters in one chassis. The 15 slots in the 19" rack save more space for fiber-optic wiring, simplifies the structure and eases the maintenance of media conversion.